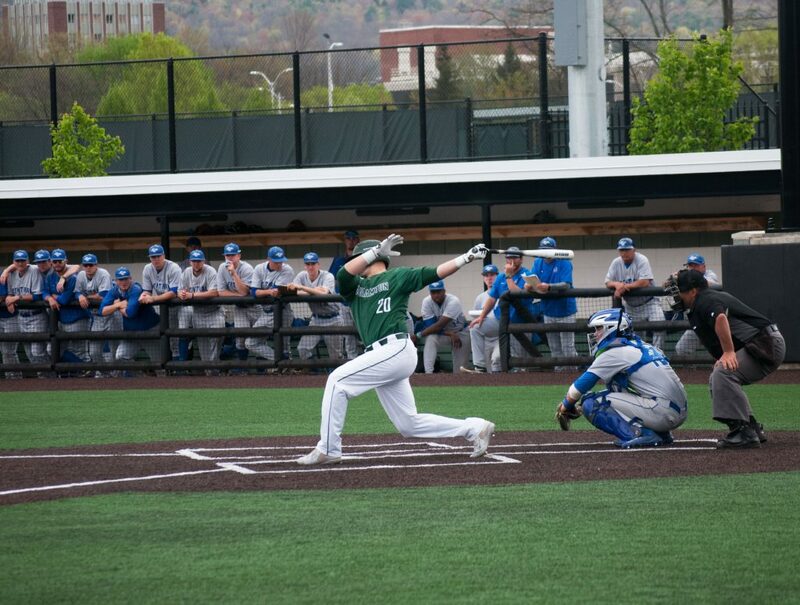 Jonathan Flores/Pipe Dream Photographer Senior catcher Jason Agresti recorded two hits and four RBIs on four plate appearances in Binghamton’s sweep of Siena. After a walk and two singles, senior catcher Jason Agresti stepped up to the plate with the bases loaded and no outs. He knocked a grounder through the right side of the infield, plating two runners to give the Binghamton baseball team a 2-0 lead over Siena College in the first inning. As Agresti stepped up for his next at-bat, BU had a three-run lead, thanks to an RBI double by senior shortstop Paul Rufo. Agresti knocked in two more runs with another double, as the Bearcats (16-27-1, 8-13 America East) went on to beat the Siena Saints (15-30, 11-7 Metro Atlantic Athletic Conference) in game one of the doubleheader. The Bearcats went on to sweep the Saints with scores of 9-1 and 10-0. Following the five-run advantage that Binghamton jumped out to in the third, it tacked on four more in the sixth. With two outs and runners on the corners, Rufo came to the plate for his fourth at-bat of the contest. He notched his second double of the game, driving home both base runners. Rufo finished the day three-for-four with three RBIs. Agresti stepped into the batter’s box next but ended up striking out on a 3-2 pitch. Fortunately for the Bearcats, however, the ball made it past the catcher and Agresti reached first. Additionally, Rufo scored on the play, giving BU a comfortable eight-run lead. Agresti then crossed the plate on an RBI single by senior outfielder Pat Britt. Britt ended the day two-for-four with an RBI. Sophomore starter Ben Anderson picked up his second victory of the season, pitching five scoreless innings. Through those five innings, he only faced 15 batters even though he allowed three base runners, as the Bearcats’ defense turned three double plays. Anderson’s ERA moved down to 1.71 on the season. Game two of the doubleheader went even better for Binghamton despite playing with a very different lineup. Senior pitcher Joe Orlando started the game with four scoreless innings, only allowing three hits. The bullpen finished out the game with three more scoreless frames, surrendering just one hit in the combined shutout. Binghamton’s offense started hot once again as it jumped out to a three-run lead by the end of the first. Freshman outfielder Shane Marshall recorded his first of three hits on the day with an RBI single. The Bearcats continued their stretch as sophomore catcher TJ Wegmann plated one with a double in the second inning. Marshall continued his performance with a single, a stolen base and eventually scored on a pass ball in the third inning to extend the margin to five. In the fifth inning, Marshall again came to the plate and knocked in another run with a single. He then stole his second base of the game and scored on a single by junior outfielder Sean Trenholm. The Bearcats added more runs in the top of the sixth as they increased their advantage to 10-0. This brought the total runs scored to 19 throughout the 14 innings of the doubleheader. The Bearcats are set to begin a home weekend series against UMBC on Saturday. This is the last conference series for the Bearcats, who are currently in seventh place in the AE. In order to make the playoffs, BU will need to win more games in this three-game series than sixth-place Maine records in its final five AE games. First pitch for game one is scheduled for noon on from the Bearcats Sports Complex in Vestal, New York.